Lancia has always involved tradition, but in a rather thoughtful way. Tradition suggests continuity, but how do you have radical innovation continuously? Seems a bit odd. That is the problem they had to solve, c. 1950. The announcement of the Aurelia was the moment for Gianni’s first new Lancia. Imagine the time, and the pressures: the new car was radically different from the old, not just in terms of engine configuration, but also in terms of complexity. It was the first new Lancia not developed under Vincenzo (leaving aside the Ardea). It was important that it be placed comfortably in the context of the company’s work to date and show how the past would be taken forward. This was also the new Italy, after the war, and Lancia was to help lead automotive design and production for this new society. These conflicting goals must have caused the company’s publicists some moments of deep reflection, as they endeavored to resolve these opposing issues. Such moments are now not unfamiliar to the Lancia buff: consider some 10 years later, with Fessia and the Flavia, among others, but in 1950, this was new ground to be broken. 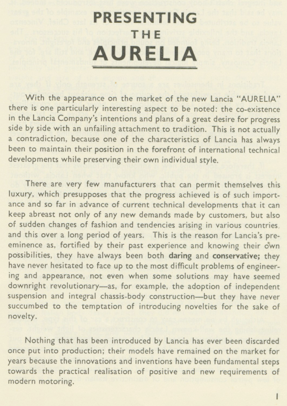 “With the appearance on the market of the new Lancia “AURELIA” there is one particularly interested aspect to be noted: the co-existence in the Lancia Company’s intentions and plans of a great desire for progress side by side with an unfailing attachment to tradition. This is not actually a contradiction, because on the the characteristics of Lancia has always been to maintain their position in the forefront of international technical developments while preserving their own individual style”. “This is the reason for Lancia’s pre-eminence as, fortified by their past experience and knowing their own possibilities, they have always been both daring and conservative. …. 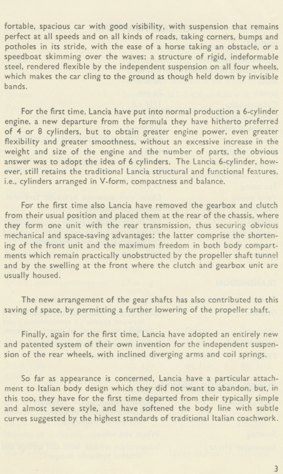 Nothing that has been introduced by Lancia has ever been discarded once put into production: their models have remained on the market for years because the innovations and inventions have been fundamental steps toward the practical realization of positive and new requirements of modern motoring”. Both daring and conservative…. 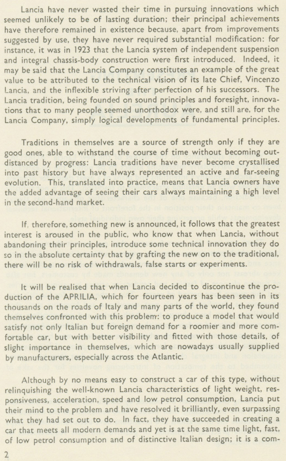 Lancia states that these are reconciled, with new and positive progress. Seems as if belief in scientific progress can resolve the old and the new. How can this be? “The Lancia tradition, being founded on sound principles and foresight, innovations that to many people seemed unorthodox were, and still are, for the Lancia Company, simply logical developments of fundamental principles. While this is a slippery rhetorical argument, it does have soe credence. This established, they then note that in these new times, the agenda has changed somewhat. The Aurelia now has to meet new concerns, with both Italian and foreign demand for roomier and more comfortable car, still with Lancia characteristics of light weight, responsiveness, acceleration, speed and low petrol consumptions. resolved it brilliantly….”), and that meeting these modern demands solves both new and old agendas. Thus, the use of independent rear suspension, the 6 cylinder motor (still with a V-form, compactness and balance), gearbox and clutch to the rear of the chassis – saving space, and making more room inside. They departed from the simple and severe style…. with subtle curves, within the highest standards of traditional Italian coachwork, even with their particular attachment to a style…. All the pieces are there to make a full argument. This may be one of the less convincing parts of the brief, but it is delightful in the reading. One can almost see them trying to work this all out. But in the end, some interesting principles are at work overall. The Lancia DNA has been declared – it is both conservative and progressive, and the work of Lancia is to reconcile the old and the new. This new product is surely part of the family. Ironically, the new Aurelia would redefine the company, and change the picture far more than anyone ever imagined in 1950. The next twenty years would produce many more changes in the path of Lancia. This brief moment, seemingly so radical at the time, would just be one event among many changes.